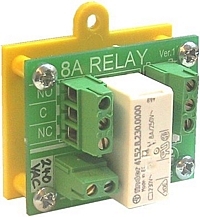 The Easy Relay 240 is designed for use in interfacing general mains voltage to lower voltage applications. The relay is of a compact power type and has two sets of silver alloy contacts, capable of switching 8A each. This switching relay could, for example, be used to interface a mains voltage lighting switch to a 12V lighting system. Other applications could include interfacing 240V door release circuits to lower voltage release units. As mains voltages are used activate the relay it is essential that the Easy Relay 240 is installed by a qualified person who will adhere to the latest IEEE electrical wiring practices. The unit must be securely fixed in a suitable enclosure with at least one screw.